Main body content information for the introduction to My Place (WA) Pty Ltd website. My Place is a not-for-profit provider of individualised and flexible supports to people with disability and their families since its establishment by the founders of local area co-ordination. My Place now supports around 400 people with disability to live in their own homes, or remain in their family home, and become valued and contributing members of their community. My Place does not provide any group home, day centre or other congregate care services. People with disability who are allocated funding through The WA Department of Communities (DSC), the National Disability Insurance Scheme (NDIS) or other sources have a wide range of options as to how they use their funds and how their supports are provided to them. Information on individualised arrangements that are most commonly utilised can be found on this website to help people determine what arrangement might best work for them. What connects all the arrangements is that the person is always in control of the supports they receive; when, where and how they receive those supports; and from whom they receive those supports. Naturally, people are free to choose any mix of arrangements that better suits them at any time they wish – and free to change their minds at any time. Main body content information for the Self Management Service with My Place (WA) Pty Ltd. If you would prefer to have total control over your own funds and supports, My Place can act as your banker: receiving the money from you or the funder and distributing it to you as, when and how you require. This means that you will be responsible for arranging your own supports, finding and employing your own support people, supervising and paying them, taking out necessary insurances, providing a safe workplace, withholding and submitting tax where required, issuing group certificates and providing the necessary evidence to funder that you have spent the funds in accordance with any agreed support plan. 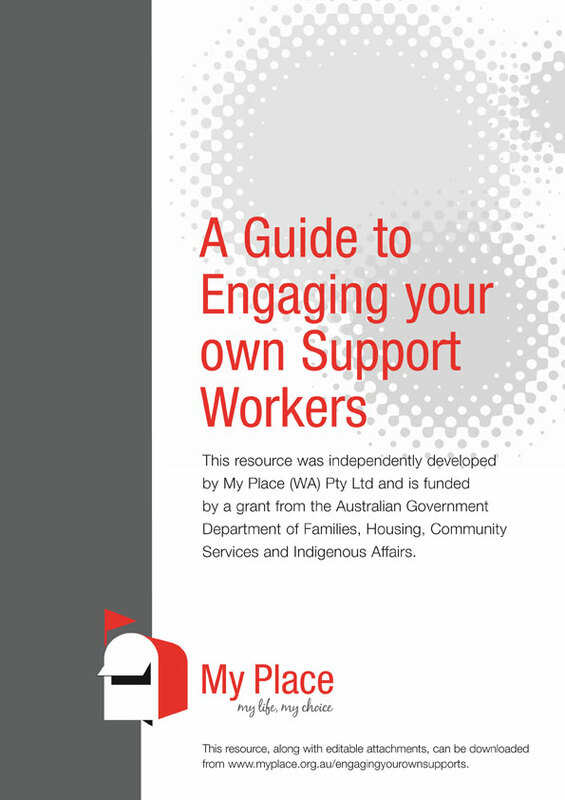 My Place has previously published an NDIS-funded brochure titled A Guide to Engaging your own Support Workers to provide practical advice and resources to people with disability and their families who are wishing to self-manage. The brochure is available as a PDF download via the button below. Main body content information for the Shared Management Service at My Place (WA) Pty Ltd.
remaining available whenever crises and emergencies arise. acquitting the funds back to the funding body. Having your funding administered by My Place gives you access to potentially significant reductions in worker’s compensation premiums, general insurance, vehicle purchase/leasing costs, GST and stamp duty, and vehicle running costs. Over time, and depending on the amount of funding you receive, this could save you up to 5% per annum. You will be given your own secure link to My Place’s individualised database, iPlace, which will provide you with real-time information on how much of your funding you have spent, what you have spent it on, how much funding is left and how much you should have spent at that point in the funding cycle. iPlace also contains all the resources you need (such as sample contracts of employment and sample policies) to be the employer of your own support people. You will also be allocated a My Place co-ordinator who will help you to plan, price and procure your supports. The co-ordinator will meet with you on an agreed cycle, be there to support you through the annual funding plan review cycle and be available as back-up at other times. My Place maintains an emergency funding pool on the unavoidable occasions that things go wrong and additional funding is needed. My Place offers you several ways of engaging your own support people. One way is for My Place to provide you with a template ‘private and domestic employment’ contract so that you can legally employ and pay your own support people. An advantage of you being the employer is that, under certain conditions, support people can be employed under ‘private and domestic’ arrangements which offers you far greater flexibility in pay levels, conditions and hours of work than a typical service provider enjoys. Another way is for you to engage an independent contractor to provide your supports. The advantages of using independent contractors is that you have fewer legal responsibilities and, while you do not have as much control over who the actual support person will be each time, you retain the flexibility to adjust your supports to suit your needs and interests. Some people don't want the full responsibility of managing their own services and recruiting their own support people, but they still wish to be the employer. For an additional fee My Place can also help you plan your support arrangements and find the right support people. Elizabeth experienced a brainstem stroke in 2006 and has used a wheelchair since. Following her stroke, Elizabeth received government funding to enable her to return from hospital to the community. After first registering with another provider, Elizabeth later transferred her funding to My Place, where she opted for a shared management arrangement. She chose shared management as she envisioned that she would be able to maximise her funding, as well as have the freedom, flexibility and control over her life that she sought: 'Living my life my own way,' as she put it. My Place provides Elizabeth with administration and payroll services, whilst Elizabeth takes care of planning and arranging the support she and her family needs on a daily basis. This means Elizabeth takes responsibility for hiring, firing and directing her support people, whilst My Place takes care of all the wages, insurances, taxes and superannuation, as well as other behind the scenes roles, such as regular reporting back to the funder. This enables Elizabeth to have autonomy in her life, the scope of which she says is broad and varied, from having full control over who may enter her home, to ensuring her support people provide her support in the manner she wants. According to Elizabeth, having this autonomy and control is a crucial element to maintaining her mental equilibrium. After marrying and having a baby, Elizabeth is enjoying being a full time 'stay-at-home' mum. Her arrangement provides her with the flexibility she needs to fully live her life and to care for her growing family. Main body content information for the support arrangement service offered by to My Place (WA) Pty Ltd. Articles on individual clients and the benefits My Place have made to their lives. becomes involved when crises and emergencies arise. Each person who chooses this type of arrangement is allocated a My Place co-ordinator. Each co-ordinator works with an average of 12 people, ensuring that they get to know you well and can remain in close contact. Most co-ordinators employed by My Place have had lengthy experience as local area co-ordinators with the WA Disability Services Commission or as service managers with other non-government disability services. My Place will charge you an additional fee to cover the cost of your co-ordinator. There are a number of specific support arrangements from which you can choose, and from which you can also ‘mix and match’. The most common support arrangements that are offered by My Place are described below. The Homesharer arrangement appeals to those who feel that the best living arrangement is to move in with a person, couple or family who have been carefully matched to you and your needs and preferences to provide a safe, secure, comfortable and welcoming home. Homesharers can be younger parents with one or two of their own children living at home, middle-aged parents whose children have left home, older couples or single people who may be of any age. You may move into the homesharer's home or the homesharer may move into your home. Identification and matching of homesharers is a very careful and thorough process with you at the centre of decision-making at all times: before and after any arrangement has commenced. My Place provides training to homesharers to further ensure they are competent and suitable to have you living with them. Homesharers are visited regularly by the My Place co-ordinator to ensure that the arrangement is running smoothly for everybody involved. My Place also offers homesharing opportunities to young people with disability who are under the care of the Minister for Child Protection. Many of these children are now adults. Some have remained living with their homesharer families while others have successfully moved into their own homes with ongoing support from My Place. More information about homesharing for young people under the care and protection of the Minister can be found in the brochure. The Mentor arrangement, as the name suggests, is less about direct support provided at agreed times by a My Place personal assistant. It is more about a My Place mentor being there at the right times (and on-call at other times) to help you make better decisions and take the right actions by understanding the consequences of not doing so. My Place mentors also connect you into your local community, assisting you to develop useful skills and to fulfil valued roles in society. My Place is leading the WA disability sector in this type of support arrangement and matches mentors to a growing number of, usually younger, people who live independently but appreciate having someone they know and trust providing them with advice and support when it is needed. The Flexible Supports arrangement involves a My Place personal assistant (our name for support workers because it underlines that you are in control) providing agreed support when, where and how you decide. This support could be in your home, in the community, at TAFE or university, in a regular workplace, at a recreation centre, in a gym, at the pool, or on holidays. Anna is 35 and she lives in the family home with her Mum and her twin sister. She has always lived at home and has a very supportive and caring family. Anna receives support from her two My Place personal assistants during the week and weekends. They support her to attend TAFE where she is improving her literacy and computing skills. Anna has established some new friendships at TAFE, which is a welcome and hoped-for development. Anna also has a volunteer job and would like to gain paid employment and, with the skills she is learning at TAFE and the support of My Place, she is hopeful she will find a job soon. Anna is currently looking for work experience opportunities in childcare and animal care. My Place is assisting her in her efforts and will provide on-the-job support during those work experiences. Anna has decided she would like to live in her own home one day. My Place and her family are assisting her to make this possible and looking for opportunities for her to increase her independence, such as developing her cooking skills. Anna invites a friend over to attend the regular cooking classes with her and she will soon be cooking a meal for her family. Anna would also like to learn to drive and has started studying for her learner’s permit with the support of My Place. A driver’s licence will be an important step on the way to independence for Anna as she currently relies on the support of My Place to catch-up with her friends, to attend the local gym and to undertake horse riding lessons. When Robert was just eight months of age he was involved in a major accident that left him with a significant brain injury. At the age of seven, Robert was placed into institutional care and remained living in various group home settings until 47. Recently, Robert decided that he would like to live in his own home and closer to his sisters. Robert was successful in securing a purpose-built house through the Community Disability Housing Program. Over the next twelve months, Robert and his family watched with excitement as his home was being built. By the end of 2013 he had a beautiful new home modified to his needs. With support from his sisters and My Place, Robert moved to his own home on January 2014. This transition was huge and scary for both Robert and his family. However, in a very short space of time, it was evident that he was blossoming in his new living arrangement. Robert shares his home and his life with a live-in couple, Claire and Barry. Robert and his sisters have had full say in who supports Robert in and outside of his home. Robert identified early on that his priorities were to become stronger and healthier to increase his level of independence, to see more of his family, to make new social connections and to be involved in the daily running of his home. When asked what the best thing was about living in his own home, he said ‘I get to go to the shops when I want, buy what I want and cook what I want for dinner each night.’ Whilst not without its challenges, Robert continues to become more independent and confident: proving that it is never too late to find a place to call home. Damien is 27 and has been supported by My Place since he was 18. Originally he lived with a family in a homeshare arrangement, but eventually wanted to move into his own home. Damien's homesharer helped him get ready to live in his own place by showing him all the things he would need to do around the house: like cooking, cleaning, shopping, paying bills and budgeting his money. Soon after he turned 25, the homesharer and My Place helped Damien to find and rent a suitable house in an area that he wanted to live. Damien also wanted to share with another person for companionship and to help out with the rent, bills, cooking and cleaning. Damien is supported by two mentors who help him to problem solve and work toward his goals. Damien previously attended a workshop for people with disability, but he is now testing out a range of employment opportunities in the regular workforce. Damien's mentors are tutoring him to improve his reading and writing. They have also assisted him to get his learner's permit and he is currently having driving lessons, which will make it much easier to find the right job and to visit friends and family. Recently, Damien secured a dream job as a boom operator with a local video production company. Like everyone, Damien acknowledges that he has not always made the best choices and things have not always work out well for him. However, he also knows that, no matter what situation he finds myself in, his mentors are on his side and will not judge or criticise him. Instead, they will encourage and support him to deal with the consequences of those decisions and to maker better choices in the future. In 2005, one week after his 18th birthday, Nathan was hit by a car while riding his motorbike. The accident almost killed the apprentice electrician and left him with an Acquired Brain Injury. This has greatly affected both his mobility and his speech. Nathan has been supported by My Place since 2011. He lives independently with a flatmate of his choosing and is supported by two mentors from My Place. One of his mentors is a personal trainer and the other is a professional voice coach. Those two skill sets align with Nathan’s biggest goals, which are to increase his physical mobility and improve his speech. Nathan has spent months on the mats at the gym. Not only can he now stand unassisted, but he recently jumped for the first time in the 10 years since his accident. The mentors also support Nathan with meal planning, budgeting, bill paying, house work, medical appointments and communication. All of this is done in a very consultative and facilitative way. Nathan enjoys an active lifestyle and strong connections with family, friends and his local community. He has taken up a past passion of woodworking, using only hand tools to create utensils and furniture for family and friends. He and his flatmate recently undertook an epic across-Australia camping trip. Nathan is living life the way he wants and My Place is there to support him when and how he wants. Nathan has now turned his experiences into a compelling story of change and hope. As Nathan likes to say, ‘None of this has affected my ability to be awesome!’ He speaks in public about his experiences since his accident and how for him to be successful, he needs his supports to be absolutely customised to him. Main body content information for the about us page to My Place (WA) Pty Ltd website. Describing their values and commitment to service. Autonomy - Promotion of independent thought and action through exploring, choosing and creating. Individuality - Acknowledging and respecting our unique needs and desires. Equality - Promotion and protection of equal rights and opportunities for all. Accomplishment - Personal success, growth and fulfilment. Security - Stability of desired lifestyle and confidence about the future. Humanity - Preservation and enhancement of the well-being of all. Follow the proper process should you have a complaint or grievance. Main body content information for the Research and Evaluations page for My Place (WA) Pty Ltd website. Providing information of each of the hour DSC programs under which My Place is funded. The WA Department of Communities, from where My Place receives most of its funding, regularly evaluates disability support organisations to assess whether they are delivery quality services. The most recent evaluations are available for viewing below. My Place is an active researcher into individualised services for people with disability who are living in their own homes in the community. Recent research publications can be viewed below. Main body content information on the directors of My Place (WA) Pty Ltd website. Greg is a clinical and educational psychologist who has worked in the disability field for 35 years. From 1987 to 1996 he was Director of Country Services and a member of the Corporate Executive of The WA Department of Communities of Western Australia. During this time he established Local Area Co-ordination, which now operates across Western Australia (either as LAC or My Way), in a number of Australian states and in several other countries. Greg holds the position of Adjunct Associate Professor at the Centre for Research into Disability and Society at Curtin University in Perth. He is a member of the Partnership Forum, which brings together a select group of leaders from State Government agencies and not-for-profit organisations to improve outcomes for Western Australians through partnership in the policy, planning and delivery of community services. Greg was formerly National President of the Australian Society for the Study of Intellectual Disability (1995 - 1997) and of National Disability Services (2003 - 2005). Until recently, he was also Executive Director of EDGE Employment Solutions, a disability employment agency he co-founded in 1984. Greg was also a co-founder of My Place, along with fellow My Place Directors Peter Dunn and Phil Deschamp. Cert. IV (Disability Work), MBA. Darren began his disability career in 1986 as a Trainee Social Trainer with the Authority for Intellectually Handicapped Persons (now The WA Department of Communities). During his 13 years with DSC he held positions of Social Trainer, Training Officer, Senior Social Trainer and, ultimately, Local Area Co-ordinator. Darren left the government in 1998 to continue his career in the non-government sector, rising eventually to Manager, Accommodation Services at Nulsen Haven Inc. He joined My Place in 2004 as a Service Co-ordinator and was appointed to the newly created position of Manager, Direct Care Services two years later. In 2009 Darren was appointed Managing Director of My Place. Darren recently completed his Master of Business Administration at the University of Western Australia and is a graduate of the Australian Institute of Company Directors (AICD). He is currently Chairman of WA’s Individualised Services (WAIS), an organisation co-founded by My Place, and a Board Member of Developmental Disability (WA). He has previously served as Chairman of the NDS National Committee on Accommodation and Chairman of the NDS (WA) Accommodation Sub-committee. For most of his career Tony Ryan has worked as lecturer and researcher at Curtin University and The University of Notre Dame Australia. While at Curtin University he directed the Centre for the Study of Teaching, was Head of the School of Foundation Studies in Education and, later, Associate Professor and Dean of Education. Subsequently, he was appointed Professor and Dean of Notre Dame’s College of Education. Other senior administrative experience has been through appointments as Executive Director at Curtin University and, at Notre Dame, as Director of the University’s Broome Campus and Director of Quality Management on the Fremantle Campus. Born in Perth and educated in WA and Florida, Tony enjoys a close family life with his wife Philippa and their three daughters, Rachel, Jennifer and Alexandra. Rachel and Jennifer are medical doctors practicing in Melbourne, and Alexandra is a teacher at St Mary’s Catholic primary School in Kalgoorlie. Tony served as Chairman of the Board of My Place Foundation from 2005 - 2015. Dr Philip Deschamp has had quadriplegia for more than 50 years. While teaching in New Guinea his spine was damaged when he slipped from a jetty into shallow water. After returning to work in a wheelchair he became Superintendent of Research with the Education Department of Western Australia. After completing his PhD he established an education research company and another company to provide schools with better student information. Phil was part of one of the very first Commonwealth funded organizations run by people with disabilities to arrange their own accommodation support services. He has served on the Boards of Royal Perth Hospital, the Authority for Intellectually Handicapped Persons and The WA Department of Communities. He has served also as Chair of the Board of the Quadriplegic Centre, and the Ministerial Advisory Council for Disability Services and as President of the Paraplegic/Quadriplegic Association of Western Australia. For many years he chaired The WA Department of Communities’s Standards Monitoring Committee. Phil was a co-founder and inaugural Director of My Place Foundation. Peter arrived in WA in 1978 after teaching in country locations around New Zealand. Peter’s interest in disability was stirred after he commenced as a teacher in a large special education facility in Perth. From within the school system, he supported students to have greater opportunities in the local and wider community. In 1985, was promoted to position of principal at Mt Melville School in Albany. A key task was to provide support to teachers of students with disability in regular primary and secondary schools, and to progressively integrate the students with disability attending Mt Melville School into their local primary and secondary schools. In 1988, Peter was appointed inaugural Local Area Co-ordinator with The WA Department of Communities to support people with disability and their families across the Lower Great Southern. In this newly created position, the forerunner to more than 200 such positions around WA, he pioneered the development and delivery of supports that were individualised and reflective of what people with disability and their families wanted. In 1994, Peter moved back to Perth to manage the expansion of Local Area Co-ordination in the metropolitan area. Two years later, he was appointed Managing Director of the newly established My Place - a position he held for 13 years. Jane Anne is the mother of four and grandmother of nine. Her eldest daughter is supported by My Place to live independently in her own home. Jane Anne and her husband are the full-time carers and guardians for one of her granddaughters, who is also supported by My Place. Jane Anne has observed many changes in the way disability services are provided since she first took her daughter to the Authority for Intellectually Handicapped Persons (AIH) in 1969. There was little available to people living in regional Western Australia, so the family moved to the metropolitan area seeking services that offered early intervention. Jane Anne worked in the disability sector between 1987 – 2010, holding various positions including co-ordinating a Volunteer Service and a Day Centre and working on various consumer focused projects. Since she retired, she has remained in the sector as a weekly volunteer. She is regularly invited to speak at seminars and workshops promoting models of service provision that enable people with disability to take control of their lives. The lives of both her family members have been enhanced using a form of individualised services, known as Shared Management, through My Place. Jane Anne also retains a keen interest in the beef farming industry, running a small herd at their property at Meelon. Main body content information for employment opportunities at My Place (WA) Pty Ltd. Receive a fair wage for the work I do. We are looking for people who would like to move in with a person with a disability in a comfortable, well-located and well-equipped house organised through My Place. Payment for this support may be tax-free. We are looking for people who would like to have a person with a disability live with them. My Place can meet the cost of any needed modifications, equipment or furniture. Payment for this support may be tax-free. We are looking for people who would like to spend several hours for one or more days each week, including week-ends, being a companion to a person with a disability as they pursue their own interests in the community. Provide support to enable the person to live their chosen lifestyle. Facilitate contact with family, friends and associates. Provide support to assist the person in making informed decisions. Advocate for and with the consumer, where appropriate. Assist with self-care, general hygiene and personal presentation. Assist with cooking, washing, ironing, and house cleaning. Assist with shopping for food, clothing and personal items. Encourage independence in daily living activities, where appropriate. Encourage neighbours to get to know and become friends with the person. Assist the person to become an active member of their local community. Assist with transport and accompany the person on outings and activities. Arrange medical appointments and collect prescriptions. Transport the person to and from appointments and attend as required. Monitor the person's general health and well-being. Assist the person to prepare and develop a weekly budget. Assist the person with banking, paying bills and keeping receipts. If you feel the outlined requirements and duties at My Place are suited to you and would like to express your interest in a future position, please select either OPTION 1 or 2 or call us on 6380 2927. Our PDF Acrobat expression of interest form is available for download to apply for a position as a personal assistant with My Place. To apply online for a position as a personal assistant with My Place. Please use our electronic expression of interest application form. Main body content contact information for My Place. Main body content information for the Accessibility Features on the My Place (WA) Pty Ltd website. Users with compatible browsers have the advantage of navigating the website with the applied access keys incorporated throughout this website. This allows you to navigate around the My Place website without using your mouse. Main body content information for the Terms and Conditions on the My Place (WA) Pty Ltd website. The material and content provided on the site is for your personal, non-commercial use only, save where expressly provided, and you agree not for yourself or through or by way of assistance to any third party distribute or commercially exploit such material or content. Except as otherwise indicated, all materials on this site, including, but not limited to, photographs, results, other images, illustrations, text, video clips and written and other materials contained in this site are protected by copyrights, trademarks and/or other intellectual property rights owned, or used with permission of their owners by My Place. You may make a copy of this content for your personal, non-commercial use only provided that you keep all copyright and other proprietary notices intact, and you agree not to modify, copy, reproduce, republish, upload, post, transmit or distribute by any means or in any manner, any material or information on or downloaded from the site including but not limited to text, graphics, video, messages, code and/or software without our prior written consent. No right, title or interest in any material or software is transferred to you as a result of your use of the site or any such permitted downloading or copying. To the extent permitted by law, neither we nor any of our officers, employees, agents or related bodies corporate will be liable in any way (including for negligence) for any loss, damages, costs or expenses suffered by you or claims made against you through use of www.myplace.org.au or any failure to provide www.myplace.org.au or in connection with any products, services or information supplied, offered to be supplied or advertised via the site. If, in My Place's reasonable opinion, you breach any of these terms and conditions, we may suspend, terminate or limit your access to www.myplace.org.au effective immediately. If any of these terms and conditions are invalid or unenforceable, they will be struck out and the remaining terms will remain in force. If we do not act in relation to a breach by you of these terms and conditions, this does not waive our right to act with respect to subsequent or similar breaches. In these terms and conditions a reference to 'we/us' means a reference to My Place and a reference to "you" means any person at any time using or accessing the site at www.myplace.org.au and includes their successors in title. Appropriate levels of privacy and confidentiality are maintained in the collection, disclosure and storage of consumers’ personal information. Only collect and store information about the consumer that is directly relevant to effective service delivery and My Place Foundation’s duty of care responsibilities. Advise the consumer and their family that My Place Foundation needs to record and store information appropriate to the support that My Place Foundation provides. Advise the consumer and their family of their right to access the information that My Place Foundation keeps regarding the consumer. Direct all requests to access information from consumers and/or families to the Managing Director. Ensure that, when disclosing any personal information to another approved party, only relevant information is disclosed. Seek the written consent of the consumer or family prior to obtaining information from or releasing information or images to any other source. Ensure that personal information is stored securely. Ensure that only those My Place Foundation employees who have a legitimate need to access the above information will be granted access. Ensure that My Place Foundation holds a consumer’s personal information only as long as it is relevant to the delivery of effective services and My Place Foundation’s duty of care obligations. Promptly investigate, remedy and document any consumer grievance regarding privacy, dignity or confidentiality in accordance with My Place Foundation’s Policy on Complaints and Disputes. Ensure that consumers’ names or other identifying information is not displayed on whiteboards or notice boards that may be open to view by other consumers or the general public. Periodically review consumer files to ensure that personal information contained in them is still relevant. Ensure that consumers and their families or advocates have been provided with an appropriate summary of My Place Foundation’s Policy on Privacy, Dignity and Confidentiality and are informed that a full copy is available on request.